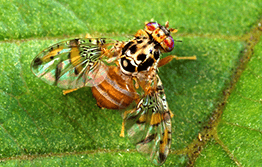 Mediterranean fruit fly (Medfly) is regarded as one of the most destructive agricultural pests worldwide. Apart from lowering production and making fruit inedible, it has severe effects on trade to sensitive local and international markets. Adult Medflies are 3-5mm long and light brown in colour, with distinct brown bands extending to the wing tips. The female pierces the skin of a fruit to lay her eggs beneath the surface, causing the fruit to start rotting. Larvae (maggots – 12-20mm long) emerge from the eggs and feed on the pulp of the fruit. It’s found in Western Australia. If you think you have seen Mediterranean fruit fly anywhere else in Australia, call 1800 084 881. Medfly is spread by moving uncertified host fruit out of infested areas. 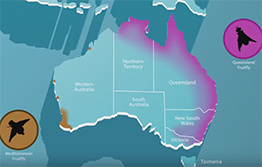 This video by the Australia Government Department of Agriculture and Water Resources gives an overview of the quarantine measures in place to prevent the spread of Queensland fruit fly and Mediterranean fruit fly in Australia.